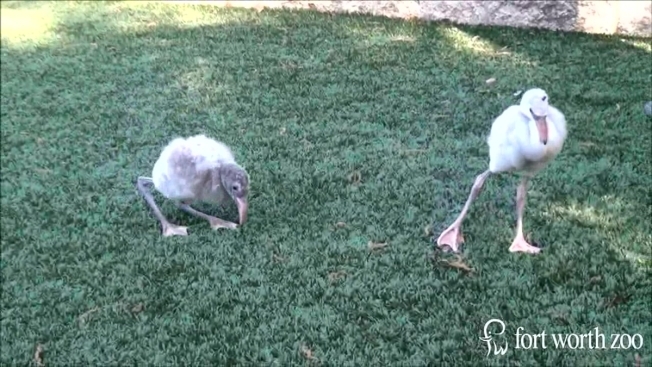 The Fort Worth Zoo says they've welcomed 13 hatchings of lesser flamingo chicks this year -- a breed they say are "extremely difficult to breed in captivity and reproduce less than any other flamingo species found in U.S. zoos." Since the Fort Worth Zoo's lesser flamingo breeding program began in 2002, they've hatched 196 of the chicks. "For years, the zoo's lesser flamingo collection was housed in an outdoor, natural habitat that resulted in little breeding success. After making adjustments to the birds' nesting habitat, which included adding heating lamps, a small pool and mirrors to provide the illusion of more birds, zoo staff celebrated the first successful hatching," the Fort Worth Zoo said in a news release Tuesday. "The Zoo's lesser flamingo breeding efforts are incredibly important to create a long-term, self-sustaining population of these birds in U.S. zoos - lesser flamingos are listed as near threatened by IUCN, the International Union for the Conservation of Nature, primarily due to habitat alteration." The Fort Worth Zoo is competing against other U.S. zoos to be named one of the 10 best in the country. To vote for your favorite, visit the USA Today poll here.